HARVEST weed seed control (HWSC) is often described as the holy grail of weed management, but we all know how the saying “Behind every successful person…” ends. There’re usually more factors at play than just the individual, whether that be lots of coffee or a great support team. The same goes for HWSC. Research by Michael Walsh from University of Sydney and John Broster from Charles Sturt University has shown that crop competition plays an important support role in the success of harvest weed seed control. 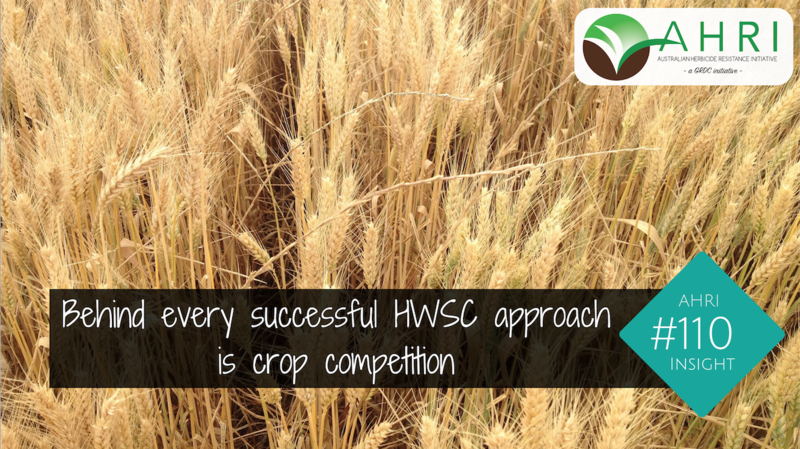 A survey of 71 wheat crops across Australia showed that the more competitive crops caused ryegrass to grow upright (seeking out light) and set seed higher in the crop canopy, where a greater proportion can be captured through HWSC. When you consider that crop competition in its own right also reduces ryegrass seed production, it seems to be a support act punching above its weight. But what happens over time? Does the ryegrass adapt to HWSC and become more prostrate or does it start to shed seed earlier? A survey at nine of the locations where HWSC had been carried out for five or more years showed no clear evidence that ryegrass had ‘adapted’ compared with nearby sites with no history of HWSC. Although the potential for resistance to HWSC remains, it seems it may not occur readily in the field. 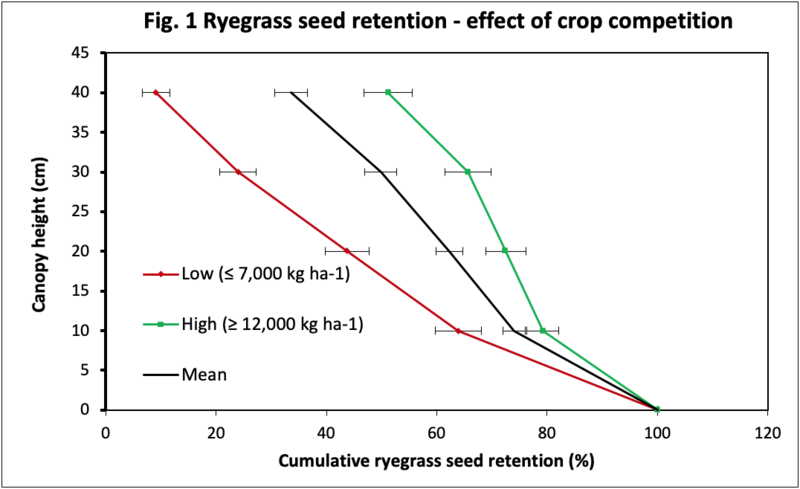 Intensive measurements of ryegrass seed retention in relation to canopy height and crop biomass were taken in 71 wheat crops, randomly selected from cropping regions in southern and western Australia in 2013. The survey found that in an average crop with biomass of nine tonnes/hectare, 74 per cent of ryegrass seed was retained above 10 centimetres in the canopy. However, this increased to 79pc in the more competitive crops with higher biomass (>12t/ha) and decreased to 67pc in the less competitive crops (biomass <7t/ha). 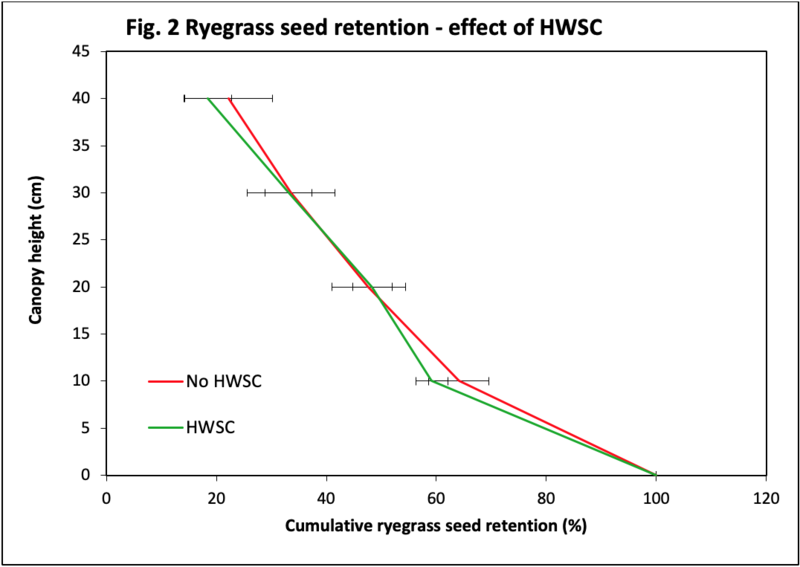 So, in terms of HWSC efficacy, you can potentially capture 12pc more ryegrass seed by growing a more competitive crop (e.g. with narrow rows and/or higher plant density) and forcing ryegrass to set seed higher in the canopy. Like many annual crop weeds, ryegrass doesn’t tolerate shading, typically responding by growing taller to seek out more light. Increased shading from higher crop densities promotes more upright ryegrass tillers and as a result, seed production occurs higher in the canopy – ready for capture by HWSC! Mature ryegrass rearing its head in a wheat crop. The general recommendation for HWSC is to harvest at ‘beer can’ height, around 10-15cm above ground, to capture as many ryegrass seeds as possible. But what happens if you need to harvest higher than 10cm? This is where crop competition comes to the fore. The survey showed that above 20cm in the canopy, the more competitive (high biomass) crops retained around 73pc ryegrass seed, compared with 44pc in the less competitive (low biomass) crops. At 40cm, the competitive crops still retained 51pc ryegrass seed compared with just 9pc in the poorer crops (Fig. 1). So, in terms of HWSC efficacy, raising the harvest height can still achieve reasonable ryegrass capture in more competitive crops. However, in poorly competitive crops, or in regions where biomass is limited by rainfall, harvest height should be kept as low as possible to achieve adequate results. Will ryegrass develop ‘resistance’ to HWSC? We know annual ryegrass is a particularly adaptable species and there is concern that it will develop resistance to HWSC, potentially through developing a prostrate growth habit and/or shedding seed earlier. As part of the research survey, nine paddocks were selected where HWSC had been implemented at least five times to compare the height of ryegrass seed retention with nearby paddocks where there had been no HWSC. Across the nine sites, there was no clear impact of HWSC on reduced seed retention (Fig. 2). However, with increasing selection pressure, the potential for resistance to HWSC still remains. There’s no doubt that HWSC has been a major breakthrough in herbicide resistance management, but it’s not a magic fix in isolation. It’s just one of the WeedSmart Big 6 tools that work together to control weed survivors every step of the way. Some work particularly well in combination, such as crop topping + HWSC (‘Canola Combo’) and crop competition + pre-ems (AHRI Insight #107). This research shows we can now add another combination because it seems ‘behind every successful HWSC is crop competition’. 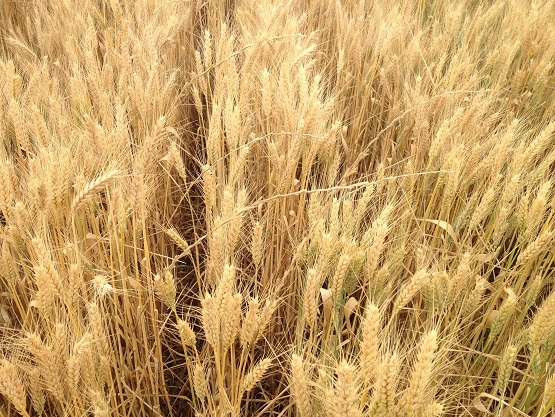 Paper: Influence of Crop Competition and Harvest Weed Seed Control on Rigid Ryegrass (Lolium rigidum) Seed Retention Height in Wheat Crop Canopies (Walsh et al 2018).